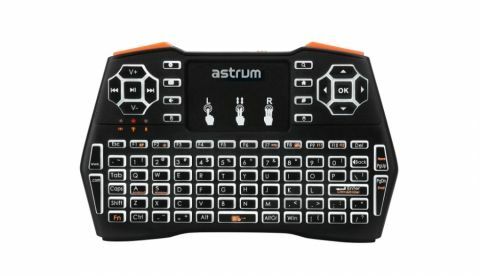 The Astrum KW360 works as a wireless keyboard and also integrates functions of a touchpad. Astrum has launched its first wireless smart keyboard in India, the KW360. Priced at Rs 1,999, the device works with smart TVs. It features a touchpad and supports adjustable DPI resolution. It sports qwerty keyboard for typing, and features shortcut keys for launching the Web browser, muting the volume and more. Expanding its portfolio, Astrum, one of the leading ‘new technology’ brand known for its innovative and intelligent solutions expands its smart product category by introducing Wireless Smart Keyboard “KW360”. Search, select, and control your content with the familiar typing experience, fluid gestures of the touchpad, or the point-by-point precision of the Pad. Ergonomically designed the keyboard comfortably fits in the hand with an adjustable DPI resolution that allows you to set the sensitivity as per your preference. Compatible to both Android and OS the keyboard is ultra-handy, compact and lightweight. The keyboard comes with 3 in 1 function; the Wireless keyboard + Mouse + Touchpad along with 2.4Ghz wireless Nano receiver. Its classic 360-degree flip design, Qwerty Layout for Quick typing, plus a touch pad for tactile onscreen control enables smooth performance. It has a nice selection of shortcut keys, so the user can quickly launch the Web browser, Mute the Volume, search or launch the email app and more. The LED Backlit makes it easy to use with the convenient option of well-spaced keys to minimize typing errors. The keyboard with the long battery life, supports 10m wireless transmission range, making it suitable for large living rooms. Now connect your Smart TV or Android Player with Astrum wireless keyboard and enjoy gaming and other entertainment non-stop. The product is already available with leading retail stores & online on Amazon. Can anybody suggest best smart phones under Rs.10,000?